We no longer carry the 1979-93 Mustang Inner Door Handles Polished Billet. Check out 1979-1993 Mustang Interior Door Handle & Bezel for an updated selection. 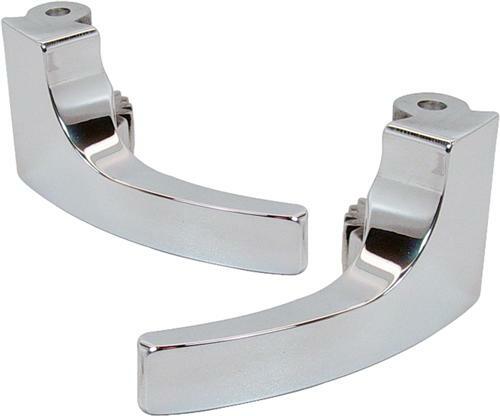 Add a pair of these polished inner door handles to your 1979-93 Ford Mustang! Looking to Dress up the interior of your 79-93 Mustang a Little? LRS has you covered. These Polished aluminum door handles replace your factory plastic ones to give you a great looking and more durable handle. All you have to do is drive out the retaining pin on your factory handle, switch out the handles, and re install the pin. That's it, everything functions the same and looks great at the same time. In 1989, Mark Mainiero and his son Joe started UPR Products with Mustangs in mind. With the help of their employees Jeremy Martorella and Bart Tobener, they brought in more racing victories and records than any other shop of that time. In 1998, Joe recognized the need for a company that fully understood the Mustang racer's suspension needs. While making customer service his main priority, he strived to offer the strongest, lightest, and highest quality parts at an affordable price. A firm believer in the “keep it simple” philosophy Joe made sure all his components could be easily installed and adjusted. Shop UPR for high quality Mustang performance and dress up components.